Nearly everyone with babies or small children knows to use a child safety or booster seat when transporting their child in a car. Unfortunately, securing a child properly is not always that easy. According to the National Highway Traffic Safety Administration, only one in four parents do it right. This means that thousands of small children are needlessly facing serious injury or death because their seat will not prevent them from being ejected or, because of improper placement, will suffer harm or death from a deployed air bag. Car accidents are the leading cause of death for children up to the age of 9. If you only use a seat belt for your toddler or child who is 8 years old or younger, their suffering a traumatic head injury increases substantially. 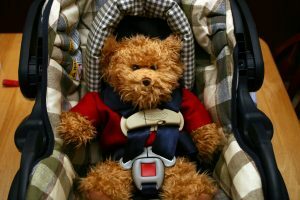 The Centers for Disease Control (CDC) found that car seats reduce the risk of a fatal injury to infants who are 4 and under by 75% and by 45% for those between 4 and 8. Always read the manual that comes with your federally approved child safety seat or booster seat to learn how to properly secure your child. For instance, many parents place the chest clip on the seat device too low instead of at arm pit level. If too low, the child can be thrown from the seat and/or harm their abdomen and internal organs. Get a seat with a LATCH system, which are required for seats made after 2002. It stands for Lower Anchors and Tethers for Children. If it has a 5-point safety harness, it must have lower anchors that are attached to your vehicle instead of using the seat belt. For a forward-facing seat, ensure that it is flat against the seat bottom and back by pushing down on the car seat. With the plastic harness clip, be sure it is across the child’ chest at armpit height. Straps must be flat and not twisted. After securing the child, tug on the straps to make sure they are snug. Adjust the seat’s recline according to the manual’s instructions. Your child’s head should not be flopping forward. The best thing you can do is to either take a car seat installation class or go to your local police department and ask that an officer check your car seat to be sure it is installed correctly. You can also go online to look for a child passenger safety seat technician who can provide that service for you. Having the best available car seat should also be a priority. You can find one by going to the NHTSA website or searching for Safety belt safe U.S.A. Contact personal injury law firm Burns & Jain today. With over 30 years of personal injury experience combined, they can give your injury case the thorough analysis it needs and hold all responsible parties accountable.